Cumbia De La Playa – ? Here’s an odd one from the somewhat misleadingly titled Afro-Rock Vol 1 which has recently seen a repress courtesy of those generous groove diggers at Strut. To be honest this comp has been put in the shade a fraction for me, as it’s not new material, and when there’s crazy refound treasures like Strut’s trio of Soweto compilations (which are uniformly awesome) and so much other African tackle about, well I slept on this track for the second time around. It’s a shady one, no country of origin or dates (as far as I know, the downside of being looked after with gems such as these in a promo style and fashion is I never get to see the sleevenotes etc) but it’s a deadly dose of dubbed out funk that needs no introduction or additional info. 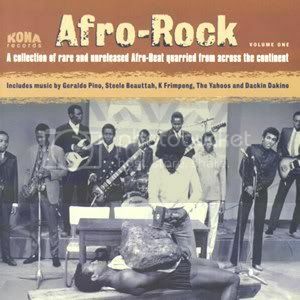 So here it is at lo-qual for a limited time, Afro Rock Vol 1 i s readily available from here on disc or here digitally ( Conch site seems to be down right now – but check them!) so get busy with your pounds, pence, dollars and cents. Aromatherapy will be conjuring up its vaporous vibes as ever this Thursday from around 8.30, and I’ll be spinning at Barrio on Saturday from 10pm – 2.30am. What that? Where that? you say. Well tis me old mucker Roger Perry’s bar and it is a most convivial hideaway on the right end of Ponse On By Road (next to Sawadee, by the Crummer Road lights if you know what I mean). Come check it out, they have the vibes, I have the tunes…what more need be said??? Hi Jim – think that trio of Soweto comps is on Strut, not Soundways…. the cat behind Afro-rock vol 1, Duncan Booker, is also involved in the Soweto comps. Thanks Peter, you are of course right, one of the perils of the digital age and the tsunami of stonking material from the Struts and Soundways of the world.